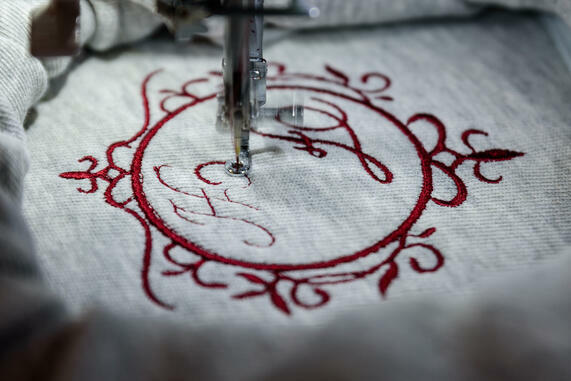 Add a one-of-a-kind custom touch with your custom embroidery. Logos look great when custom embroidered, and the quality of the embroidery will raise the bar on your employee's uniforms. It just looks classy to have that personalized embroidery on the shirts. So if you are interested in personalizing shirts, and you're torn between screen printing and custom embroidery, you can either try both or simply stick with the classic embroidery technique. If you're not sure about what fabrics or garments will look best when custom embroidered, ask an expert. When you're promoting your business, it pays to be unique, so take that extra step to come up with a solid embroidered strategy. Embroidered aprons and hats are good examples of an all-over polished and professional look for your employees. The overall look can make your business look professional and refined. You may think if you use custom embroidery, you'll be restricted to certain types of material. This isn't true at all. When you are using custom embroidery, you can choose between cotton, denim, track jackets, fleece sweatshirts and even aprons or hats. Certain types of embroidery work better on certain materials, so check with an expert when you're in the idea phase of your project. With embroidered letters, you can add names to the front of your shirt so customers can be on a more personal first name basis with your employees. This can be great with customer service, while also helping make a good first impression with your customers. Whether a waiter, plumber or restaurant manager, it looks clean and respectable. When you're choosing a custom embroiderer, think about what your needs are. Many decorated apparel manufacturers can provide you with many options, attentive customer service, and a quick turnaround. Decorated apparel manufacturers can offer many types of colors, lettering and fabric choices for your business's custom embroidered logo. They can also handle any other promotional items you might need for your company; such as hats, jackets, bags or embroidered blankets.